Music Lesson Expert has master teachers in the exact areas where you want to study and improve. Due to the fact that each type of student wants to take lessons in the specific area of their interest, we have separated the lessons into their own branded segments. You will find sister sites of ours that specialize in singing lessons, songwriting lessons, guitar lessons, and music production lessons. Each of these areas is a discipline in its own right, and yet we often find that songwriters want to be better singers, or singers want to learn to accompany themselves on the guitar. We encourage you to go to each of our sister sites and see what we have to offer and then return here to follow our new offerings, blog posts, and special packages and workshops. We can always customize a course of study that involves several of our lesson areas. There is no better place to learn about your voice and how best to use it than with the Singing Lesson Expert. From learning vocal technique, to building repetoire, to getting the coaching you need to create an optimum performance including lyric interpretation, presence, emotional connection, and meaningful gesturing, the Singing Lesson Expert can give you everything you need. Whether you’re a beginner, or an intermediate to advanced student, or even a pro, there is an amazing amount to be learned here. Either click on the website screenshot or click the link to visit the page. 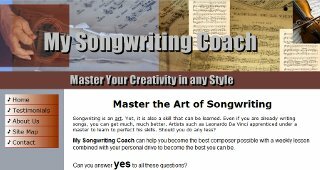 My Songwriting Coach is definitely the place to go to work on any aspect of your songwriting skills, from writing lyrics that you love and really say what you want to say, to writing powerful melodies that are easily singable, to selecting the perfect chords for your masterpiece, or choosing just the right format and structure so that your song grabs as many listeners as possible. Unless you want to leave your success to chance, see what My Songwriting Coach can do for you. This is the place to go to learn guitar the way you want to learn it. Almost every style you could want to explore is available. Whether you want it highly technical or laid back, rigorous detail or loose and free-form, hyper-focused or a broad brush approach, the Guitar Lesson Expert will take you where you want to go. You can master rhythm and/or lead playing, fingerstyle or using a pick, and learn how to create a totally unique and original approach to playing. 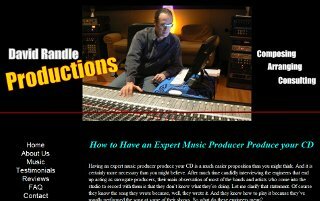 David Randle Productions is a full service production company which includes many done-for-you production solutions. However, as it pertains to Music Lesson Expert, we also make available the opportunity to learn all the elements of music production, from song choices, to arrangement and recording, to mixing and mastering. Take charge of your projects by learning what you’re doing. We are excited about the possibility of working with you and we have discounted packages for committing to month at a time scheduling. For those of you in the San Diego area, we are available for both in person private lessons and some group lessons, as well as workshops. For those of you out of the area, we very effectively use Skype to conduct lessons online.